This week, The Hobbit: The Desolation of Smaug hits theaters, introducing us to Peter Jackson's vision of J.R.R. Tolkien's most famous dragon. 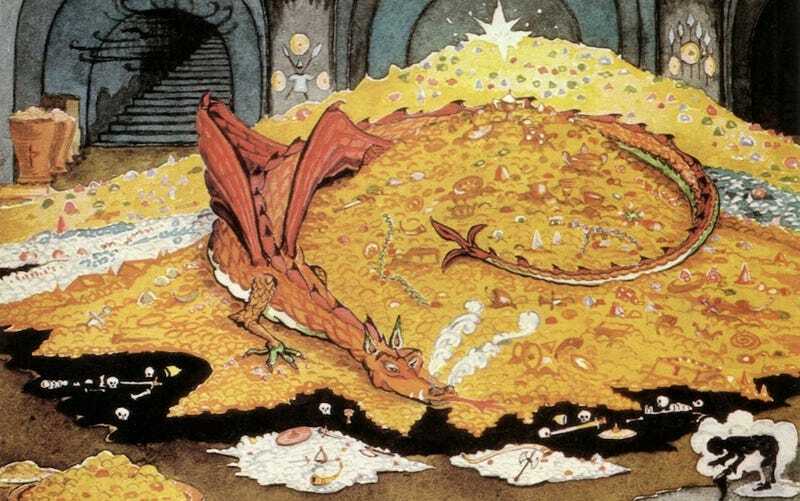 But in a media landscape overstuffed with dragons, why do we still care so much about Smaug? Top image: Crop from J.R.R. Tolkien's own illustration "Conversation with Smaug." "A dragon is no idle fancy," J.R.R. Tolkien wrote in his lecture "Beowulf: The Monsters and the Critics." Whatever may be his origins, in fact or invention, the dragon in legend is a potent creation of men's imagination, richer in significance than his barrow is in gold." The dragon Smaug remains one of Tolkien's most enduring inventions, a standout amongst an increasingly crowded field of dragon characters. And he endures not merely for being the dragon upon whom so many fictional dragons have been based, but also because he represents Tolkien's care and attention to the idea of dragons and how a well developed dragon character could interact with his Hobbit hero. It's an attention that ensured Smaug would be captivating not simply as a dragon, but as an interesting and fearsome antagonist. Tolkien had a lifelong fascination with dragons, and by his own reports was writing stories about them from an early age. In a letter to W.H. Auden (Letter 211), Tolkien refers to a story he wrote about a "green great dragon" when he was seven years old. Although the point of this reference is to highlight his mother's admonition that he should say "great green dragon" (and Tolkien's fledgling thoughts on language), it marks an early venture into fantasy. Smaug was by no means the first dragon by pour from Tolkien's adult pen, nor even the first dragon he placed in Middle Earth. But Smaug embodies much of Tolkien's thinking on dragons as literary figures, even if he appears in the pages of one of Tolkien's more juvenile-targeted stories. I never imagined that the dragon was of the same order as the horse. And that was not solely because I saw horses daily, but never even the footprint of a worm. The dragon had the trade-mark Of Fairie written upon him. In whatever world he had his being it was an Other-world. Fantasy, the making or glimpsing of Other-worlds, was a profound desire. I desired dragons with a profound desire. Of course, I in my timid body did not wish to have them in the neighborhood, intruding into my relatively safe world, in which it was, for instance, possible to read stories in peace of mind, free from fear. But the world that contained even the imagination of Fáfnir was richer and more beautiful, at whatever cost of peril. Tolkien scholar Tom Shippey in The Road to Middle-Earth suggests this essay hints at Tolkien's "conviction…that fantasy is not entirely made up." But whether Tolkien saw some truth in his "glimpses" of the Fairie realm or his writing was a direct response to modernist scholars who downplayed the fantastical in their analysis of literature, Tolkien took his fantasy creations very seriously and his dragons were no exception. In 1938, for example, he played naturalist of the fantastical in a Christmas lecture on dragons for children at the University Museum, Oxford. In that lecture, he described two types of dragons—creeping and winged—and even brought along a slide showing his watercolor illustration of Hringboga Heorte Geysed, the Coiled Dragon, telling the children, "Here is a nice little worm in an early stage of growth, a newly hatched dragonet, which was pretty (as young things so often are)." Beowulf's dragon, if one wishes really to criticize, is not to be blamed for being a dragon, but rather for not being dragon enough, plain pure fairy-story dragon. There are in the poem some vivid touches of the right kind—as tha se wyrm onwoc, wroht waes geniwad; stonc aefter stane ["By then, also, the dragon had wakened and with it new strife. It slithered and sniffed along the stone walls"]—in which this dragon is real worm, with a bestial life and thought of his own, but the conception, none the less, approaches draconitas ["dragonishness"] rather than draco ["dragon"]: a personification of malice, greed, destruction (the evil side of heroic life), and of the undiscriminating cruelty of fortune that distinguishes not good or bad (the evil aspect of all life). I find 'dragons' a fascinating product of imagination. But I don't think the Beowulf one is frightfully good. But the whole problem of the intrusion of the 'dragon' into northern imagination and its transformation there is one I do not know enough about. Fáfnir in the late Norse versions of the Sigurd-story is better; and Smaug and his conversation obviously is in debt there. And lonely ever I live. To make the link even stronger, Fáfnir sits atop a pile of cursed gold, treasure that triggers corruption and greed not unlike the dragon-sickness seen in some denizens of Middle Earth. But even Fáfnir is not a true dragon; rather, he is a man who has been transformed into a dragon, akin to Eustace in C.S. Lewis' Chronicles of Narnia. So while Tolkien may have borrowed some ideas from the exchange between the Norse hero and his foe, it was up to Tolkien to invent the qualities of his dragon, and while Smaug might have a storied history, his personality proves perfectly modern. Shippey aptly describes Smaug's manner of speech as having "the characteristic aggressive politeness of the British upper class, in which irritation and authority are in direct proportion to apparent deference or uncertainty." By placing this modern tongue in an apparently ancient body, Tolkien imbues his dragon with a fearsome physicality and intelligence, a figure who keeps you on your toes as he reminisces over the fine meal he made of your ponies—and yet may be subject to humanish foibles. It's appropriate that not just Smaug's speech but also his name reflects Tolkien's love of language. In an early draft of The Hobbit, the dragon was named Pryftan, until Smaug won out. The name "Smaug" Tolkien explains to the Observer in Letter 25, "The dragon bears as name—a pseudonym—the art tense of the primitive Germanic verb Smugan, to squeeze through a hole: a low philological jest." Tolkien doesn't elaborate on the nature of that jest, and David Salo, a linguist and Tolkien scholar who worked on the Lord of the Rings films, writes on his Midgardsmal blog, "Why this derivation would be humorous, even to philologists, let alone a 'low jest' is, I suppose, something for the reader to guess at." Shippey, on the other hand, connects it to an Old English spell, wið sméogan wyrme, "against the penetrating worm." And it seems to connect to Gollum's name, Sméagol. Who gets to be a hero? Who gets to kill a dragon? Although Smaug is not himself a mere allegory—he comes with a backstory and a personality all his own—he does serve a role in outlining various notions of heroism in The Hobbit. The dragon, Tolkien notes in his scholarship, is no mere beast. It is not Grendel, whom Beowulf kills and survives. It is "potent," and when a dragon dies, there must be someone to slay it. Beowulfs get to kill dragons. Sigurds get to kill dragons. Hobbits do not get to kill dragons. However, they can still perform acts of heroism, even in the face of dragons. Bilbo Baggins is, from the view of Tolkien's original audience, a very modern figure: soft, bourgeois, comfortably living a quiet English life until Gandalf comes along and drop-kicks him into his adventure. Surrounded by creatures straight out of an edda, Bilbo (and, to a lesser extent Gollum) are anachronistic, and much of the comedy of The Hobbit comes from the juxtaposition of the grand, heroic speeches of the characters around him with Bilbo's own longing for his warm, dry Hobbit-hole. If the dragon is the right end for Beowulf, and I agree with the author that it is, then Grendel is an eminently suitable beginning. They are creatures, feond mancynnes ["solitary sinners against mankind"], of a similar order and kindred significance. Triumph over the lesser and more nearly human is cancelled by defeat before the older and more elemental. But Bilbo does not meet his end at Smaug's spear-like claws, and in fact, does not battle the dragon at all except in the form of the "sacred" riddle-game. However, in an early draft of The Hobbit, Bilbo sneaks into the dragon's lair and stabs him with a knife, a less than fitting end for a dragon and an act that his various adventures, including his run-in with Gollum, did not prepare him for. At the heart of Tolkien's Beowulf essay, though, is that Beowulf is the work of a Christian poet looking back on an earlier pagan era, examining its ideas about heroes and monsters from his post-pagan perspective. Tolkien must have felt a kinship with this writer (even as he tut-tutted his dragon); here he was cooking up his own non-Christian English mythos, using the trappings of ancient and medieval literature alongside his own inventions and mixing them with his modern sensibility. And while The Hobbit may not have the dirge-like tone for an invented earlier era that Beowulf and Lord of the Rings do, there is the sense that heroes of the classical mold are giving way to protagonists of the modern one. Tolkien's illustration of the Lonely Mountatin, via The One Ring. By the time the band of fourteen arrives at the Lonely Mountain, Bilbo was something more than the timid fellow the Dwarves first met in the Shire. "Now he had become the real leader of their little adventure." He even, after venturing into Smaug's lair once, volunteers to return in an effort to learn Smaug's weak spot with the help of his invisibility-granting Ring. The lordly Thorin comes with all the trappings of a classic warrior—a quest, a legacy, a military history worthy of the epithet "Oakenshield"—but he sends his burgher burglar into the dragon's lair. And it's probably just as well, since Smaug boasts to Bilbo, "I laid low the warriors of old and their like is not in the world today." It will take something more than the "warriors of old" or their inferior copies to bring down a dragon. It was at this point that Bilbo stopped. Going on from there was the bravest thing he ever did. The tremendous things that happened afterward were as nothing compared to it. He fought the real battle in the tunnel alone, before he ever saw the vast danger that lay in wait. Again, Shippey puts this nicely, noting that, outside of fantasy stories, "no one can fight a dragon, but everyone can fight fear." And even though the killing blow goes to a warrior, the soldier Bard who earns the title "Dragon Slayer," Bilbo's willingness to enter the dragon's den and engage with the silky, sarcastic Smaug makes him a hero in his own right. That steadfastness and pragmatism in the face of peril also plays out in Bilbo's later dealings with the Arkenstone; he is a figure not sworn to his liege lord but out to solve problems and then go home and have a nice cup of tea. Bard, incidentally, has a bit in common with Sigurd. After killing Fáfnir, Sigurd roasts the dragon's heart and, upon tasting the heart, gains a knowledge of the language of the birds. Bard knows the language of the birds by virtue of being a man of Dale, which is how he is able to learn of Smaug's weak spot from the thrush who overheard Bilbo's conversation. If Smaug were an allegory, if he represented fear or avarice, he might be something that a warrior of old could conquer. If he were a one-note fairy tale creature, like the ogre in "Puss-in-Boots," he might be brought low by Bilbo's flattery. But the expansion of Smaug beyond the outlines of Beowulf's dragon or Fáfnir, into a character with a personality and intelligence makes him something more fearsome than Bilbo could ever hope to defeat. And perhaps his death is a great consequence for such a little Hobbit, but it's something in which the readers who are thrust into the world even when they would rather be home curled up with a pipe (or their copy of The Hobbit) can find inspiration. Tolkien lambasted a critic of Beowulf for claiming that the poem contained "a wilderness of dragons," but in today's fantasy literature, that's precisely what we have. In the wake of books like The Hobbit and The Chronicles of Narnia, the shelves are packed with all manner of fantasy creatures who exist both within and far outside children's stories. Dragons now come in a veritable rainbow of colors. They burn up spores on distant planets. They help free slave cities at the beck and call of an ambitious young queen. They befriend cartoon children and serve as obstacles in wizarding competitions. There are dragons that would likely make Tolkien despair that no glimpse of Fairie could be found in their multicolored hides. And that's natural; those of us who grew up with Smaug and his increasingly numerous successors will inevitably twist and turn dragons into new forms. But it's worthwhile to look back at that older version of the modern dragon and think about what we can learn about heroism from a potent, if fallible, foe. Perhaps Smaug's most worthy successors can be found less among the population of dragons than among the wider spectrum of science fiction and fantasy antagonists. At first glance, for example, the xenomorphs from the Alien franchise could hardly be more different from Smaug; they lack his mythological heritage and his fondness for conversation. But they share that "bestial life" that Tolkien found so lacking in Beowulf, that sense that exist as more than mere antagonists and possess their own interior lives, even if those interior lives are completely foreign to us humans. And while they seem nearly impossible to kill, they can bring out hidden strengths in the right protagonist. A dragon may be more of an idle fancy now than it was in Tolkien's day, but that doesn't detract from the magnificence of Smaug. Smaug doesn't necessarily offer a template for dragons, but he does remind us to be thoughtful about our approach to monsters and to find worthy—and sometime unexpected—heroes to challenge them. Humphrey Carpenter, Tolkien: A Biography. Jonathan A. Glenn, "To Translate a Hero: The Hobbit as Beowulf Retold." Wayne G. Hammond and Christina Scull, J.R.R. Tolkien: Artist and Illustrator. Deborah Webster Rogers and Ivor A. Rogers, J.R.R. Tolkien. Tom Shippey, The Road to Middle-Earth: How J.R.R. Tolkien Created a New Mythology. J.R.R. Tolkien, "On Fairy Stories," as published in Tales from the Perilous Realm. J.R.R. Tolkien, "Beowulf: The Monsters and the Critics."